James Neiss/staff photographerNiagara Falls, NY - Guy Bax, the manager of Schmidts Collision & Glass in Niagara Falls, may look a little shady behind bars at Honey’s Pizza on Military Road, but good detective work revealed his motive to be pure, influencing a judge to pronounce a lenient sentenced for him to raise $1600 in bail. 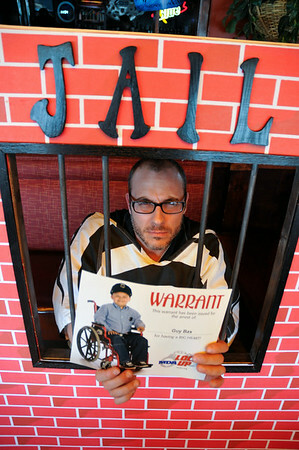 The MDA Lock-Up program seeks out prominent local businesspeople to raise their bail to send “Jerry’s Kids” to Rotary Sunshine Camp in Rush, NY. The bail for the program is set at $1600, which sends two children to summer camp. These jailbirds are asked to turn themselves in and are arrested once they arrive. Their mug shots are taken behind bars and they are then seated in their jail cell, where they call their friends, family and business associates who pledge to bail them out.